Dreamed of having your own all-weather arena? There are several options for their construction, but taking shortcuts is a risky business that will very likely cost you money and clients in the future. 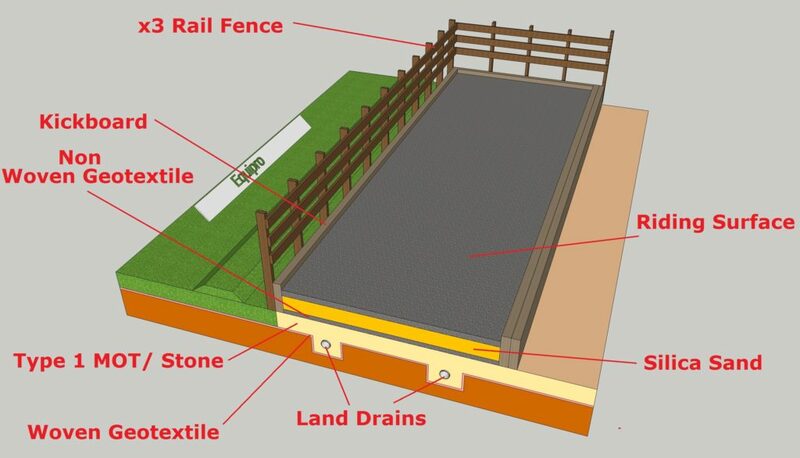 So what is the best way to build a horse arena? If you have found someone who knows the answer to this question, you should ask them to explain the true meaning of life while they’re at it. Building an arena is just as much art as it is science. If you asked a twenty people for their views on the best way to build and surface an manege, you will end up with a twenty different answers, if they know anything at all. If you carry out some online research you will probably find your eyes will end up as rectangular as your arena, and you’ll still have no definitive answers. The main problem differential is your location. The raw ingredients for any arena – be they clay, shingle, sand, or limestone – vary from county to county. Lime from one quarry that performs superbly in one arena construction may have different qualities to that taken from a quarry 30 miles down the road. There are huge variations in the kinds of sands you can buy. Clay also, demonstrates many different properties. Pooling water create soft, boggy patches. It also affects ride quality, and will ultimately lead to failure of the surface and its sub-layers. You will soon end up with areas of the arena containing a porridge of all the layers you had lovingly (and expensively) carted in and used on your arena. The one thing you don’t want is water pooling and sitting on your manege. There are two critical factors when installing drainage. Firstly, you want to create a ensure you have a gentle fall so that water is naturally encouraged off the arena. The most common approach is to create a modest crown down the centre line, and have drains running along each side to collect the water and carry it away. Rainfall will run through the pourous top surface and membranes and to the compacted at the bottom of the construction. From here most of it should run off to the sides. It’s simple in theory. Much will depend upon on your rainfall, the soil type, and, hopefully, using the natural lie of the surrounding land to make this all work. If drainage poses a major issue, you may need to depart from the model described above and consider an alternative option. A series of herringbone drains can be installed across an arena to carry water to the outsides. Excavation: a product of arena construction is a large quantity of topsoil. It will cost to cart it away so consider ways of putting it to use. Perhaps it could be shaped into a bund to provide shelter for your arena or home, or perhaps spread on surrounding fields? However, these drains will need to be placed in a sublayer that remains reasonably porous when compacted. 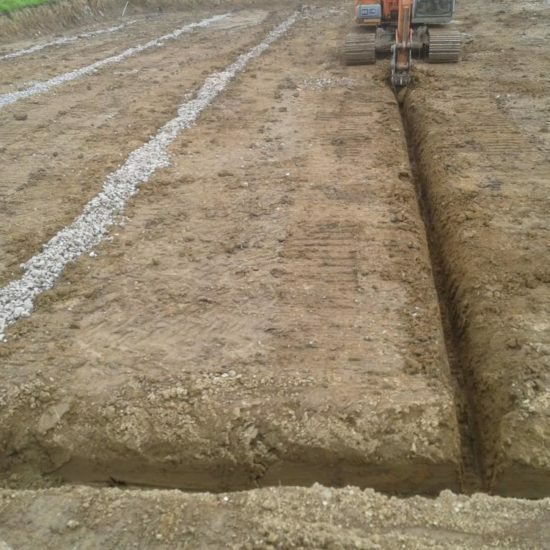 The whole drainage system will add considerably to the final cost, but may be the only solution if your only available area has a heavy soil and cops a lot of rainfall. Geotextiles may be used to cover these drains to prevent other materials used in the arena’s construction entering the drainage system. This will naturally increase the final cost, but will greatly extend the life of the drains. Inadequately protected drains will quickly clog and fail. If you can select high ground, you’ve got half the battle won. Normally, side drains will suffice. Seek advice if you’re unsure. Finally, you may like to call it an all-weather arena, but show it some kindness. Using it straight after a 50mm downpour only increases the risk of damaging the crucial sublayers. Most arenas have some form of edging. Be careful this does not interfere with the drainage of the arena, or all your hard work will be for nought. The last thing you want is water pooling around the outside of the arena because of edging that creates a barrier, as this is arena area that will normally get the most use. The average 40m by 20m arena requires industrial quantities of material and it’s very easy to think that saving a few hundred pounds on the base materials would be okay and cause no problems. The basic arena recipe: Excavate to a good base. Bring in the clay if necessary. Apply at least a 100mm layer of type 1 stone/ MOT and compact. Apply a thin layer of crusher dust and then your top layer to the desired thickness. A type 1 stone/ MOT weighing about two tonnes per cubic metre, you won’t get any more than 12 cubic metres per wagon load. For a minimum 100mm thick layer, you’ll need 80 cubic metres, or nearly seven wagon loads, to cover your arena. You’re better off when it comes to transporting in the lighter lime, with trucks probably able to carry about 20 cubic metres, but that’s still at least four truckloads. Suppliers may be looking to charge you £35 a cubic metre or more to deliver it. If you’re reasonably close to the source, you might save on transport costs by hiring trucks on an hourly rate to deliver the materials. Be sure of your maths before committing either way. Arena construction has been compared to road construction. 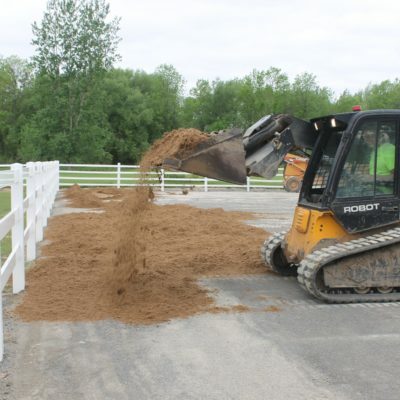 A road will be only successful if the tbase materials are applied to a compacted base. Exactly the same applies to an arena. It’s that top layer where you’re going to give your horse the grip and cushioning that will make the arena enjoyable for all to use. Beneath that, you want a hard surface. If a horse’s hoof does chop through your top layer, you don’t want it damaging the layer beneath. This will eventually lead to the two layers mixing and, ultimately, failure. If you can easily dig up this layer with your heel, it’s probably not hard enough. Do not shortchange your arena on base materials. By doing so you’re reducing its ability to compact to a uniform hard layer that will prevent undesirable material from underneath coming to the surface. Make no mistake. If your base layers fail, your arena fails. It hurts to throw money at something no-one will ultimately see, but those sublayers are crucial. 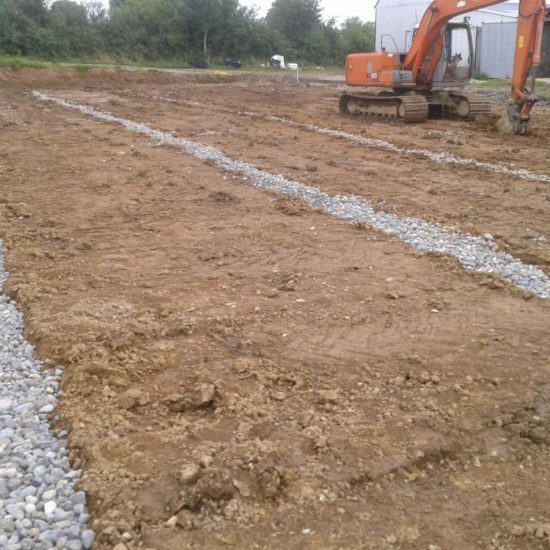 You can save some money if you have a suitable location on your property for any topsoil removed during construction. Otherwise, this material will need to be carted away, at additional cost. Whatever use you put this material to, ensure that you regrass it as quickly as possible to prevent a muddy slurry running off during heavy rain and causing havoc, particularly when it comes to waterways. Do your homework. Check out local arenas that have given good service and find out how they were built. Avoid low-lying areas, and pick a spot where any fall will help to carry water away. Excavate to a good base before carting in materials. Don’t skimp on base layers. There are no shortcuts. Ignore drainage and there’s a good chance your arena will fail. Plan the project for the drier months. There will be plenty of trucks coming and going. You don’t want them stuck in your sodden paddock. Allow for regional variations in materials. A recipe that worked in one district may not work in yours. Keep up arena maintenance, and don’t use it after heavy rain until at least some of the water has drained off. Before looking at the different kinds of arena surface materials, you’ve got to consider what you want to achieve with your top layer. Some people prefer a soft arena, others a much firmer surface. Unfortunately, horses can’t tell us which they prefer. All of us want to avoid a hard surface that can cause jarring injuries. 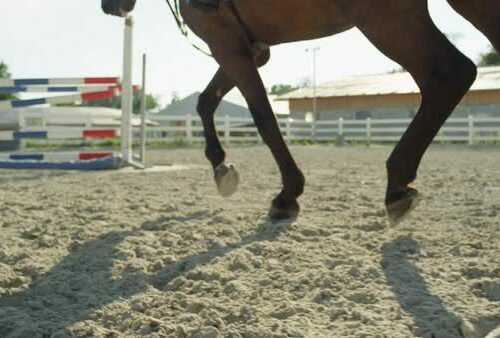 However, there is little doubt that you can cause serious problems if your arena is too soft. 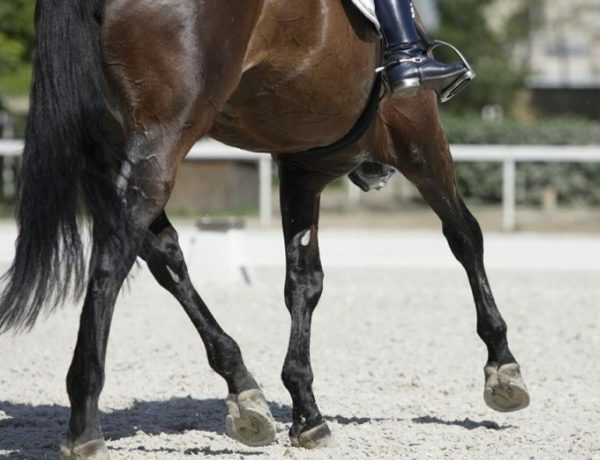 You might think that you’re providing a lovely, easy-going surface, but there’s a real chance you’ll place undue stress on a horse’s tendons and leg muscles. Why? An ideal surface will provide good traction and, just as importantly, an even, consistent base. This is because every animal, be it a horse, a human, or a hare, makes a split-second decision with every stride. The brain decides the instant each leg has found firm footing and the muscles start to propel the animal forward. If the animal is in very soft sand, it’s very difficult to determine when the body should begin each “power stroke”. The result can be overstretched tendons and muscles. All will become clear if you go to a beach and take a run across a soft sand dune. The top layer has to display a couple of other practical properties. You don’t want it to whip up a dust storm in a strong wind, and you certainly don’t want it taking flight in a gale. Equipro’s riding surfaces have been constructed taking all these factors into consideration, we believe we have the best and most comprehensive all-round riding surfaces.